Take a moment to let that sink in. Think of the further implications. 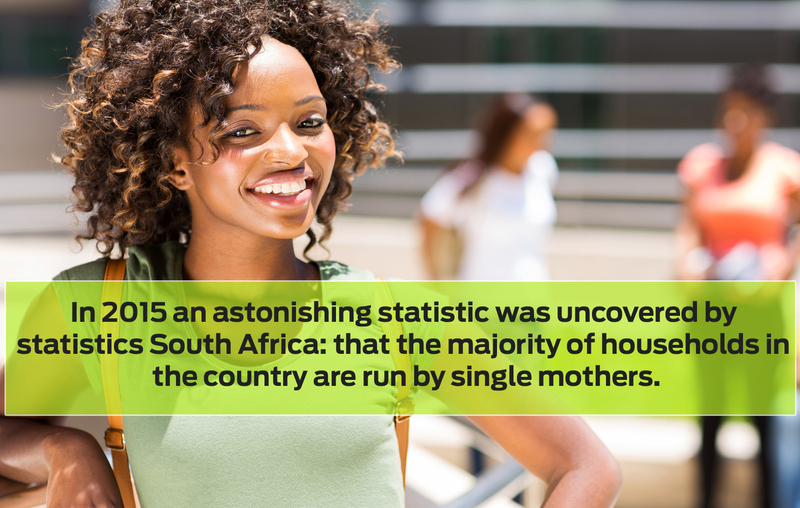 It means that most children in South Africa are growing up in homes without fathers. Most families have to get by on a single person's salary. Most of the burden of raising the next generation is being carried by women on their own. We clearly need to focus on alleviating this burden as a society, and creating more support structures and processes. We also need to find as many ways as we can of encouraging these (mostly very young) women. The traditional family set-up will have the man providing most of the financial resources for the household. Of course, as women's emancipation has evolved, women are increasingly contributing equally financially. However, there are still many places in South Africa where the traditional model is followed: men going out to work to support the family, with women raising the children and running the household. the children while the mother is working. What's very clear is that we need to provide much more support for women caught in these situations. One option is the state- or corporate-sponsored day-care centres that have begun to emerge. Another is to examine whether these women are earning a fair salary, given the recognised income disparities between men and women in South Africa, and indeed most of the world. Part of the reason for the financial pressure experienced by these young single mothers is that many are only qualified for traditionally low-paying jobs, like being domestic helpers. There is a desperate need for these women to learn the skills that will allow them to earn higher incomes. Various bursary, scholarship, and commercial government initiatives exist; we can only benefit from their continued expansion, and a redoubled effort to focus specifically on single mothers. These women face a dual challenge - even if they receive full financial aid to study and gain new skills, finding the time for studies between a full-time job and running a household is often a bridge too far. This again speaks to the need for family support structures to allow these women to develop their potential. The Human Sciences Research Council has found that having a father in the home leads to better mental and intellectual development and school performance. Conversely, the absence of a father was found to lead to depression and other emotional distress. When it comes specifically to the girl child, research shows that growing up with a father leads to a girl who has higher self-esteem, is less likely to engage in risky sexual behaviour, and has less difficulty creating and sustaining relationships later in life. The result is lowered rates of teen pregnancy and children born outside of marriage, as well as a lower divorce rate and less likelihood of marrying too early. Now remove the father from this picture and the effect on the young girl is the opposite. Which means that in the majority of households in South Africa, young girls are growing up with an almost predetermined set of dysfunctional traits that can handicap them for life. And then they themselves are almost inevitably called on to head their own households at far too young an age. Intervention at all levels is required to untangle this Gordian knot. It remains all our responsibilities, in whatever our capacities, to encourage these young women and girl children, both in emotional ways and also in practical ways that address the very real challenges that they face on virtually all fronts. Let this be the message we take from this year's Women's Month.